The Marxist Perspective is a central theory within A level Sociology. This post outlines some of the key concepts of Karl Marx such as his ideas about the social class structure, his criticisms of capitalism and communism as an alternative. This is a slightly modified version of the AS Sociology intro handout on the basics of Karl Marx’s thought. 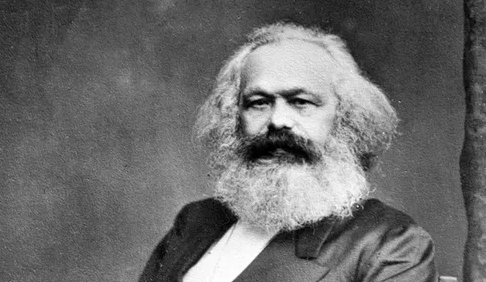 Karl Marx (1818- 1883) was alive in the middle of the 19th century, and it’s important to realise that his theories stem from an analysis of European societies 150 years ago. Marx travelled through Europe during the mid and later half of the 19th century where he saw much poverty and inequality. The more he travelled the more he explained what he saw through unequal access to resources and ownership of property, wealth. He argued that the working class (proletariat) in Britain (and elsewhere) was being exploited by the ruling class (bourgeoisie). The ruling class paid the working class less wages than they deserved, made them work long hours in poor conditions, and kept the profit from the sale of the goods produced. Thus, the ruling class got richer and the working class became increasingly poor, and had no way of improving their prospects, unless… Marx argued, they all came together to overthrow the ruling class in a revolution. Equality for all in the shape of Communism would replace an unequal capitalist system. Because Marx’s theory is based on criticising Capitalism, you really need to understand what Capitalism is – see the separate Handout/ blog ‘what is Capitalism’? The Bourgeoisie or the Capitalist class are the ones who own and control the wealth of a country. These control the productive forces in society (what Marx called the economic base), which basically consisted of land, factories and machines that could be used to produce goods that could then be sold for a profit. The majority, or the masses, or what Marx called The Proletariat can only gain a living by selling their labour power to the bourgeoisie for a price. Marx argued that the bourgeoisie maintain and increase their wealth through exploiting the working class. The relationship between these two classes is exploitative because the amount of money the Capitalist pays his workers (their wages) is always below the current selling, or market price of whatever they have produced. The difference between the two is called surplus value. Marx thus says that the capitalist extracts surplus value from the worker. Because of this extraction of surplus value, the capitalist class is only able to maintain and increase their wealth at the expense of the proletariat. To Marx, Profit is basically the accumulated exploitation of workers in capitalist society. Marx thus argues that at root, capitalism is an unjust system because those that actually do the work are not fairly rewarded for the work that they do and the interests of the Capitalist class are in conflict with the interests of the working class. Marx argued that those who control the Economic Base also control the Superstructure – that is, those who have wealth or economic power also have political power and control over the rest of society. Superstructure All other institutions: The legal system, the mass media, family, education etc. Marx argued that the ruling classes used their control of social institutions to gain ideological dominance, or control over the way people think in society. Marx argued that the ideas of the ruling classes were presented as common sense and natural and thus unequal, exploitative relationships were accepted by the proletariat as the norm. The end result of ideological control is false consciousness – where the masses, or proletariat are deluded into thinking that everything is fine and that the appalling in which they live and work are inevitable. This delusion is known as False Consciousness. In Marxist terms, the masses suffer from false class consciousness and fail to realize their common interest against their exploiters. As far as Marx was concerned, he had realised the truth – Capitalism was unjust but people just hadn’t realised it! He believed that political action was necessary to ‘wake up’ the proletariat and bring them to revolutionary class consciousness. Eventually, following a revolution, private property would be abolished and with it the profit motive and the desire to exploit. In the communist society, people would be more equal, have greater freedom and be happier. Marx’s concept of social class has been criticised as being too simplistic – today, there are clearly not just two social classes, but several; moreover, most people don’t identify with other members of their social class, so it is questionable how relevant the concept of social class is today. Clearly Marx’s predictions about capitalism ending and the ‘inevitable success of communism’ have been proved wrong with the collapse of communism. Capitalism has changed a lot since Marx’s day, and it appears to work for more people – it is less exploitative, so maybe this explains why it still continues to this day? 1) Family = Parents want the perfect family and they compete with one another for the best house, car, holiday and the best dressed/most successful children etc. This is encouraged through advertising and TV programmes. Significant sums of money are spent in pursuit of the “perfect” family. This benefits the bourgeoisie in two ways 1) Parents work harder at work improving profits for their companies owners – the bourgeoisie 2) Parents spend more of their salary on providing this lifestyle – this benefits the bourgeoisie as they can make more profits by selling goods and services to the parents. Furthermore, it makes parents feel “happy” about family life and society generally, even though they might work 13hr days for an average salary, rarely seeing their family. Lastly, children grow up watching their parents behave in this manner and then replicate it as adults with their own families. 2) Media = the mainstream media is controlled by few wealthy individuals who promote the ideas and beliefs that maintain the bourgeoisie’s wealthy position in society. This encourages people to accept beliefs which benefit capitalism and legitimise (justify) the exploitation of the proletariat (workers) as normal. The media justify exploitation and even make it into games shows. 3) Education = encourages people to accept hierarchy and to be obedient. This is good for capitalism as it creates students who will later become good workers. Also, schools emphasise high achievement and high flying jobs – implicitly this means highly paid jobs, better profits for company owners and more exploitation for the workers. Schools also encourage the idea people get what they deserve in education, when in reality educational achievement is primarily a result of the chance circumstances of your birth i.e. who your parents are. Read Francis Wheen’s biography of Karl Marx. Previous post: How do Social Policies Affect Family Life? Next post: Is Marxism Still Relevant Today? Hey thanks, you always lose something when simplifying, but sometimes you just have to! Really a good gist out of a complex political thought..it has made easier for the students to understand Marxism. Marxism is the body of theory which informs the practice of communism.